In today’s virtual space, business is no longer restricted to local boundaries. In fact, a global audience (and team) is now available to small and large businesses alike. From small businesses to corporate giants, all businesses depend on technology to overcome problems and prosper. When it comes to small business growth, greater effort is required to get the competitive edge. Our business consulting efforts can help you identify loopholes and integrate the best technology solutions that perfectly matches your business requirements and even desires. The best technology for business cuts down cost, is flexible enough to adapt to changes, and saves time. We at Quacito, help small businesses tackle a diverse set of problems, including, but not limited to: going paperless; increasing profits by streamlining sales processes; improving your company image; growing your brands’ footprint; and upgrading your systems to match the dynamics of your competition. Go paperless: Technology can do wonders if implemented for the best cost, at the right time, for the right purpose. By automating your sales process, you can eliminate time consuming steps, spend more time with leads and customers, eliminate unnecessary costs, evaluate business performance, and so much more. Similar operational improvements can be further integrated or created into any segment of your business lagging behind. We treat every client according to their unique needs and desires; we’ll start from scratch to understand your business process and transform it into the dream you’ve always envisioned. Gain more leads: In the digital age where customers are smart enough to compare and analyze information, they seek for quality information on the web. Through our online marketing efforts we will help you deliver the right information, at the right time, to the right people. Sound redundant? We beg to differ – consistent principles lead to great business success and attracting quality leads. Beyond web leads, we also have powerful solutions for the service industry that will generate more revenue for your company than any other lead generating option. It’s time you learned about LeadNow | Active Lead Generation Software. Go mobile: Mobile is no longer trending: it’s the standard. It’s more important than ever that your business is available on a mobile device – and there’s no one-size-fits-all in many business scenarios. There are many devices to plan for and build for. Contact us to discuss if additional mobile optimization will bring you new opportunities. Our mobile application development services not only help businesses go mobile – we also develop custom applications and can help your business stay ahead of the competition – or catch back up. Upgrade your brand: There is only one thing that is constant in this world and that is change. Technology keeps on changing, hence, businesses need to implement regular upgrades to stay up to date with the changes offered to consumers. Our web development services help clients stay ahead of the competition by implementing the latest web innovations in their business. 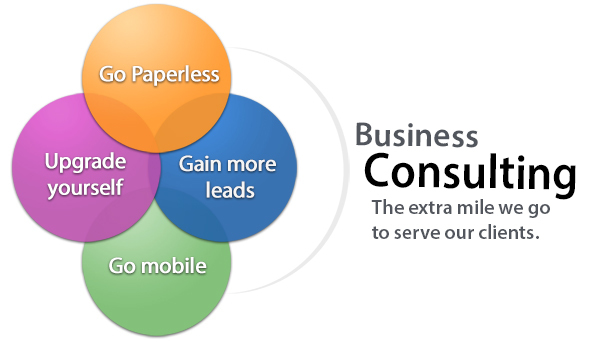 Through our business consulting efforts we aim to identify your exact need and deliver the best mix of solutions . Therefore, call us! We’ll help you go paperless, cut costs, and boost your profits.